A Google Like Button: Adsense for Social Network Sharers? 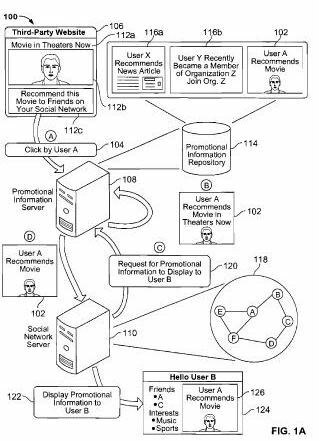 A Google patent application published last week describes how Google might enable visitors to websites to share information that they’ve found with others on social networking sites such as Twitter, Facebook, YouTube and other sites. In some ways, it seems like a response to the Facebook Like Button. In one implementation, a method for providing information to computer users includes receiving at a server system an indicator of an action performed on a third-party website by a first user of a social network of users. The method can also include creating by the server system first promotional information based upon the received indicator and information associated with the first user of the social network. The method can further include persistently storing by the server system the created first promotional information in a repository of promotional information, wherein the repository stores promotional information associated with a plurality of third-party websites for display to users of a plurality of social networks. The method can additionally include receiving at the server system a request for promotional information to display to a second user of the social network, the second user having an acquaintance relationship with the first user. This created promotional information can be stored and displayed to the user’s friends on the social network. 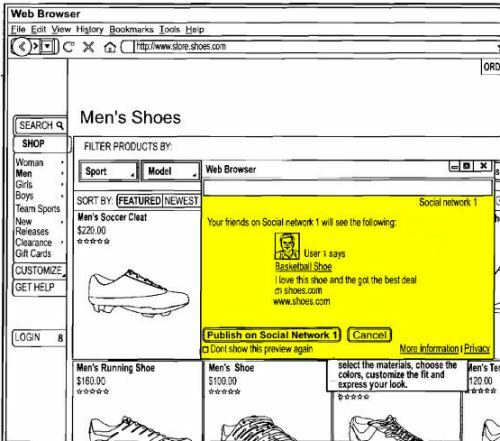 For example, a friend of the user on the social network may be presented with promotional information regarding the user’s shoe purchase when the friend views a page (erg., the friend’s landing page) on the social network. So, while an ecommerce site might share information about products that they have for sale, a news or media site might show news instead. By propagating promotional information based, at least in part, on acquaintance relationships, the promotional information server can create “word of mouth” advertising among users of a social network. Since “word of mouth” advertising is among the most effective forms of advertising, third-party websites may value promotional information created by the promotional information server greater than other forms of advertising. As such, third-party websites may bid greater amounts to display promotional information created by the promotional information server than bids for other forms of advertising. Users of a social network may be provided with incentives to share their activities on third-party websites for the purpose of creating promotional information. For instance, a user may receive a portion of the revenue generated by the display of promotional information associated with the user (e.g., an advertisement regarding a recent purchase made by the user) on a social network. Additionally, a social network can receive revenue for displaying promotional information to its users. Is this a step that Google might take in the future? Should a shared link that was paid for by an advertiser, with the revenue split with someone who shared it on a social network be considered a paid link and/or an endorsement, with a requirement that it be labeled an ad – something I don’t see in the example screenshot above, showing a recommendation for shoes on a social network. How might Facebook or Twitter respond to such shared links? The patent notes that it might share revenue for those advertisements with the social network sites as well. That is going to be a powerful motivator! Lots of people would share a link in the hopes that some of their friends would possibly buy the same item and get a bit of revenue from the transaction. Let’s just hope that people don’t go overboard and bombard their social networks with countless promotional links. I expected that Google would do something to meet Facebook’s “Like-button” concept. The Like-button on facebook ads is a genius invention. I hope though that Google doesn’t mess it up and make things too complicated. I think that the main reason for Facebook’s success the last year is that they are so good at keeping things simple. Interesting, Bill. At first glance, this would seem to be just a new twist on marketing, with an eye toward taking advantage of an increased focus on social. It also brings to mind, though, the fact that it could easily be made to tie into Linked Data. We seem to be seeing more patents subtly edging into that territory. Looks like things will continue to be interesting for a while yet, eh? I think there is some strong possibilities with such an offering and social commerce. This has the potential to be a “self-serve” Groupon Killer if done right. I think it was a natural progression for google to create something in response to the ‘like’ button. I also agree that there is potential for businesses to benefit more from this version. I look forward to seeing whether we are right in our predictions. I see it as a direct form of advertising because of the way it will be shared on a user’s social media profile which is very different from the Facebook like button. Businesses would benefit much from it whereas the like button of facebook is more on the side of the user. If there is any SEO blog worth following, than itÂ´s yours. Thank you for this information, IÂ´m sure Google will eat FB in the future, even if they need a few tries more. I love Google! I can see that Google is struggling a little bit from the Social Media front. However, I have this instinct feeling that Google surely will come up with something that will outperform all the social tycoons! Seems like this share button by Google will be something revolutionary. Sometimes I think we share too much. Let’s ask ourselves, do we really need another button to tell our friends and stalkers that we like something? Well, the short answer is, “yes”. The slightly longer answer would be “hell, yes”. Perhaps my interpretation of this as a social advertising network is too optimistic. From the image displayed, it seems like Google’s thinking might have been to create something that, while having similar features to Facebook’s Like button, would really be more akin to an opt-in version of Facebook’s infamous Beacon program. Does the scope of the patent apply to any ‘social network’, or is it limited to specific services (ie, Orkut)? If Google combines advertising with social sharing like this, I would hope that those social signals wouldn’t be considered as potential ranking signals for organic search results or real time search results, or Google’s social search results as well. Matt Cutts has mentioned a number of times recently that while Google may not presently consider PageRank associated with the nofollow links on Twitter or Facebook, that tweets or status updates may influence the rankings of real time search results or social search results. If people and social networks are given the opportunity to split revenue with advertisers based upon these “promotional” signals, I hope those are excluded from influencing search results. There is the potential for abuse of a system like this, and while people can remove connections, unfriend, etc., would a Twitter or Facebook consider shared paid tweets or status updates as spam if those networks were getting a cut of the revenues? I agree – it makes sense that Google would try to do something similar to Facebook’s like button, and it’s not even surprising that they would create a way for people to indicate their “likes” on social networks outside of the control of Google itself. I’m not sure that I like the advertising aspect of the patent, but Google hasn’t launched this system yet, and if they decide to, it may look somewhat different than what is described in the patent. Google has struggled in a number of ways with social, but they’ve been slowly working social networking into a number of services where it isn’t necessarily the primary aspect of those services, such as HotPot. In some ways, I think that’s a clever approach on their part. I like your analogy to Groupon. I’m wondering how many merchants would take advantage of a system like this if Google launches it. Google’s approach to coupons in the past hasn’t been all that successful, but this could potentially be. 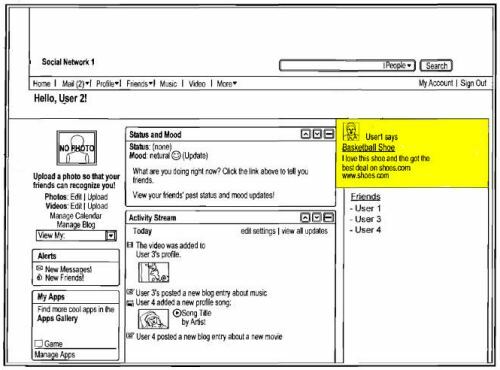 The screenshot I’ve taken from the patent shows the shoestore update to the right of the user’s status updates and news activity stream rather than part of them, but the patent doesn’t describe how the “promotional” shared information might be incorporated into the social networks they might be seen in. I’m not sure if the image is representative of how they might be used, if Google goes through with this. You may be right. If Google decides to move forward with this, I hope we don’t have to wait too long. I have seen Google sometimes launch a service within weeks or months of the publication of some patent applications, but I’ve also seen some take more than a couple of years. Thank you very much for your kind words. Google has stumbled a few times in some of their social endeavors, like Orkut and Buzz. What’s interesting about this is that it doesn’t rely upon Google’s own social networks, but rather works with sites like Facebook. Maybe that’s a difference that makes a difference. Thanks. We can only wait and see. I think the true test is going to be whether or not people decide to put these share buttons on their sites, and whether or not their visitors then use them. Intersting description. Rather than following people around the Web, this would allow people to report where they’ve been voluntarily, and possible make some money doing so. Is it a good idea? I’m not sure yet. But it is interesting. The present disclosure generally relates to creating and providing promotional information (e.g., advertising, public service announcements, etc.) to users of a social network (e.g., FACEBOOK, MYSPACE, ORKUT, LINKEDIN, TWITTER, etc.). I like it. Looks like a “feature packed” twist on Facebooks “Like” button. Thanks for posting the link to the FTC guidelines. The patent was filed about 4 months before the new FTC guidelines were published, but I think there’s a good chance that they would apply under this approach, definitely in the example in my screenshot above if it was a paid-for link/endorsement. Doesn’t it seem like Google is starting to play a little catch up with Facebook these days? Now with Facebook getting email, all that’s left is Facebook search and then the battle really begins. Bill – Another interesting article on the new moves Google has been making recently. As far as the advertising aspect using this feature we all know advertisements is Google’s bread and butter so I’m sure they will find a way to implement it properly. One things for sure, there will definitely be more sharing of links if Google does indeed give incentives to people who might share in their social networks. I’m dubious regarding googles previous attempts to engage with social traffic! The idea itself of the “like” button and allowing people to promote via thier profiles is a proven winner, however, to introduce a direct share in revenue disrupts the natural pattern and could have negative effects due to spam and marketers abuseing the system. Google would effectively be mixing adwords into peoples personal social feed, sounds annoying to me! Having said that we will have to wait until it is implemented, thanks for the heads up! I wouldnâ€™t be too sure about that. Nobody thought for a long while that Google would be taking into account Tweets or status updates until it started to show up. My first thought when hearing about this â€˜Like Buttonâ€™ that somehow it will eventually count towards the influencing of search engine rankings. And of course this will open it to certain abuse. My first thought was “mobile”. I think use of apps and mobile marketing will explode in 2011 with more and more social media consumed in that way, for that reason, i don’t see it influencing rankings. It’s word of mouth for the app generation. It seems to me that since google canâ€™t seem to win the social game, that they might try to make it irrelevant. To kill twitter and facebook by making them into squidoos. And with a number of former Google employees now working at Facebook, the possibility of Facebook venturing into search increases. I’m not sure that it would actually be a good idea for Facebook to get into search, though. It seems a little too outside of what they do, and Google does have a pretty good headstart. Facebook may be better served by growing in ways that don’t necessarily put them into direct confrontation with Google. The description of how the social sharing buttons work in the patent does provide a lot more flexibility than Facebook’s Like button, and it’s definitely something that I could see Google releasing. When seems to be more the question than if. I think one of the distinctions between this and Google’s previous forays into social is that this system can be set up to work with multiple social networks, including ones outside of Google’s control, such as Facebook and Twitter. It’s not a social network itself, but rather a way to interact with them. There are potential problems with it, and I would probably be pretty upset if these promoted tweets or status updates, or whatever they might be called, weren’t labeled in some way as different from ones where there wasn’t some kind of possible revenue sharing going on. Google does make some missteps from time to time, but I could imagine that they would put a lot of effort into making something like this work. I’m not too sure that I’m bothered much by tweets or status updates influencing realtime search results, or social search results. But, if the people posting and the social networks might share revenue for advertising through tweets or status updates, and those tweets and status updates are used to influence realtime results, social search results, and web results, then Google is introducing a way for advertisers to pay for higher placement. Hopefully they won’t do that. Good points – the worlds of mobile search and apps are growing at a tremendous pace, and social sharing over a phone is something it seems everyone is targeting more and more. I’m not sure how many times the patent filing uses the phrase “word of mouth,” but it’s more than a couple of times. Interesting question. Rather than an attempt to sabotage social networks, I think Google recognized that the Web has changed and that they needed to add services like realtime search and social search to keep up, and to not be seen as irrelevant. I would not be too sure about Facebook not getting into search. They have the audience and an integrated search engine into the main FB is something I imagine that would be under consideration as an area for revenue. I envisage a model that FB business pages can buy their way to the top of the results – in order to do this you would have a FB page thus increasing FB business membership. I may be off-mark in stating that, but as FB grows and ‘positions itself to go public’ the pressure will be on to increase its revenue. I’m not outright denying the possibility of Facebook getting into search. I’m just wondering if it’s the best direction for them to go in at this point. It’s not necessarily a core strenght of theirs right now, and may not be a good revenue generator for them at this point. However, they do seem to be bringing aboard a lot of people from other companies, including Google, and if they continue to do so, they may find themselves with some employees who have some serious knowledge about search. I’m not sure that it bothers Google too much to try and to fail, as long as they can build upon those failures and continue to have some successes in other areas. For example, Google has given up on Google Wave, but some of the technology that was developed with Wave is starting to show up in other places at Google. You would think there would be some cap or limit on revenue that can be generated via this model for a ‘contributor’ (a user who promotes the product); otherwise, social networks would degenerate into spam and 1. advertising profits would plummet, since spam overload has a habit of doing that, and 2. Facebook and Twitter would see red. That’s an interesting thought. The patent filing really doesn’t discuss the potentially harmful issues that might be associated with an approach like this, but I’d bet that those concerns would be something considered if and when this kind of social sharing might be implemented. I’m not sure that a cap would be imposed, but there might be some other approach that might be used to try to keep the harm you’ve described from happening. This patent doesn’t specifically focus upon one social network site in particular, and I don’t believe that it would create the perception that Google was being more of a follower than a leader. That it could potentially work with just about any social network that allows microblogging means that Google has developed a way of providing advertising through social networks much in the same manner that it provided a way to show ads on other people’s websites through Adsense. Is it not though true that click through rate via social media/networking are traditionally well below standard PPC levels? Would this not limit the commercialization of this functionality? Again goes to the head-space of the social networking site visitor (as I believe you pointed out to me a few months ago during my brief infatuation with the facebook like button..)? I think the whole idea is great, and I can’t imagine Google engaged into something doubtful, so this system must work well. I see the competition between Google and Facebook becomes tougher and tougher. Some time ago Facebook wanted to launch their own e-mail, and now Google think of launching their own sharing system. Let’s see what will be the outcomes. I think Google will eventually oust Facebook in the social web for three reasons. 1.) They don’t give up after the first, second, or even third try 2.) They have the money to do so 3.) It’s urgent they do so and they are aware of the fact. At this point, as far as we know, Google’s like buttons only exist on paper, in this patent filing. We won’t know how well it might work until Google moves forward with it, if they decide to do so. Thinking about it, I’m not sure that I see the relationship between Google and Facebook as one that needs to be a competition. I’m not sure that I’ve actually seen any specific data on clickthrough rates for PPC vs. social networks. I tend to focus much more on organic search than PPC, so it’s something that I really haven’t dug into. But yes, people will specifically go to a search engine with an intent to buy something, and probably won’t go to a social network with the same transactional intent. It’s interesting that this patent filing provides a way for Google to both advertise on Facebook and possibly share revenues with Facebook for those advertisements. Is Google better off competing with Facebook, or finding ways to work with them? One of the big differences between Google’s sharing button as described in this patent filing, and Facebook’s like button is that the Google approach would enable people to share on their choice of social networks, including facebook. It’s not really a head-to-head competition. I think that’s an importanc diference. I think that Google struggles with the social as well, although I wonder if that should be considered a bad thing?? It seems like everything revolves around social networking lately… Sometimes it’s nice to be able to visit a site that isn’t heavily involved in social networking. I like the idea of Google adding a “like” button of sorts… It gives consumers/readers etc. a way to make a somewhat educated decision if we are judging by general consensus. A few people have mentioned Google and Facebook in competition. I dare to say that I think they would be unstoppable if they joined forces. At this point, they are two separate entities; at their most basic functions, they serve two entirely different purposes. I’m not convinced that Google could hold a candle to Facebook in the social sense unless they came up with something drastically different that Facebook didn’t and couldn’t offer. It may seem like there’s a lot of focus upon social networking these days, but there are also a very large number of pages on the Web that provide fresh new content outside of the context of social networks, from news type sites to massive numbers of blogs, and often those pages are the targets of likes or social sharing. It makes more sense for Google to try to do something different than attempt to emulate Facebook. As you note, if the two found some ways to collaborate instead of competing, both could benefit significantly. I have spend some time over the past few years searching through social network patents to find some that are “non-obvious” and I’m not sure that many do provide something that really gives us something new. But, as you note, there are a lot of them. I’m sitting back and waiting on this one. I’m curious how Google is going to moderate the system to prevent ” + spamming “. I think they are going to do at least 2 things to try to stop spamming. One of them is to allow people to report spam or abuse in places like Google Plus (twitter and facebook allow people to do that as well), and the other is to come up with some type of reputation or credential score that might identify profiles of people/businesses that post low quality content and respond to others with irrelevant, low quality, untimely responses. Content from within Google Plus and other social networks likely won’t rank well unless the people who post it add something of value, and participate in meaningful interactions with others. At least, that’s what it looks like they might try to do. Hi Bill, I don’t think Google would share its revenue with any social networking website, specially facebook. Although yes it is time that all social networking sites do something about spamming and false posts and links are it really irritates everyone. Its a good article to read,like always. Thanks for sharing. We do know that Google had a deal in place with Twitter to allow Google to use Twitter posts in real time search results, and that Facebook has been refusing to negotiate with Google to include data from Facebook on Google. I’m not sure that we can completely rule out the possibility that Google would share revenue with any social networking site, though it’s possible that Google might be more likely to show advertisements on Google Plus these days as a priority. Google +1 is really doing a big help in sharing and promoting websites, blogs, articles, pages etc.. and it continues to roll as of today! The patent that I wrote about seemed a little more commercial than I would have hoped to see from Google, but Google does now have a + button that site owners can put on their pages, and that shows up for both organic search results and advertisements. So, we have seen them implement something that is very much like a “like” button. And with the Google Plus Your World update, you can see the things your friends might have shared on Google Plus, or liked. Not sure how Google’s handling advertisements that someone within your social network might have plussed, yet. I’m really not a fan of personalized search results, im certain that likes, shares google+ will play a big part in SEO and driving traffic back to sites. But even though i’ve got more than 150 people in my google+ circles the last time anyone updated was over 3 days agao, and most folk in my circles are from the digital industry and heavy twitter users, so something needs to happen there before it takes off! I do have a few people in my circles who update more than once a day. You mention that many of the people in your circles are heavy twitter users, so maybe most of them are focusing their attention there? I think we’ll have more to see from Google Plus, and the features that it might have to offer that may entice people to use it more frequently. I do seem a number of people who are fairly active on Google Plus in addition to Rand, and I try to participate there daily. But then again, I was never that active on Facebook. Twitter is a lot of fun, but it’s limiting trying to capture what you want to say in 140 characters or so.